The most important part of your electric system is the car battery. A car battery will get a shorter life if you let it stand half-charged a lot. If you want to make your car battery to be in good shape as long as possible, the best way is always to have your battery fully charged. Many people do only drive short distances with MAX on all consumers like fans, seat heats, etc. and in that case, the battery will never get time to get charged by the alternator. The solution to this is to charge your car battery when you are not using it. Today’s smart car battery chargers give the battery the required charge, and you can let it be connected when you want, you do not have to be afraid that you will damage it if you charge it for too long. The chargers have inbuilt monitoring that will shut off the charging when the car battery is fully charged. In this article, I will write a review about the best car battery chargers on the market and give you the information you need to buy the right one for your need. I work as a diagnostic technician, and I do use some of these chargers daily in my job, and I have chosen the ones that I’ve tried myself. If you want one of the best – This is it. 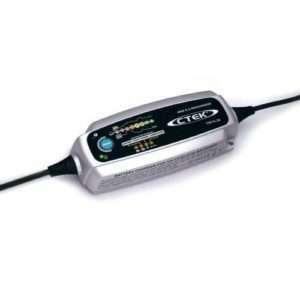 The powerful CTEK US 7002 ( Part no: 56-353). 7A super-safe charging with an 8-step automatic program that will do a complete charging for you. Water and dust resistant and can be used in any climates. Supply mode if you need direct and constant 12-14 volt supply for anything. Protections against wrong-polarity connections and spark & voltage spike proof. 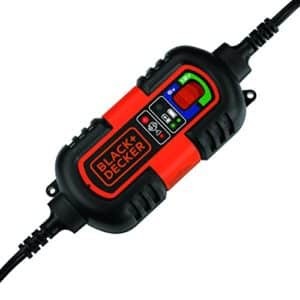 Perfect for any applications with the highest quality you can get with a car battery charger. I work as a mechanic, and we use these chargers for professional uses and charging a lot of vehicles at all times. I have never seen any of these failed with thousands of cars charger with this charger. If you are searching for a perfect quality charger for all uses and are ready to spend a bit more money, I would recommend this charger. You will get five years warranty, and it will probably last as long as you need a car battery charger. This charger is a smaller charger than the one mentioned before. 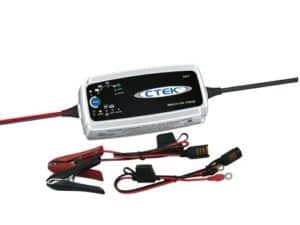 I’m using this CTEK charger a lot for myself at my job for professional use (Diagnostic technician). If you only want the best you should check these out. This is a 4.3 Amp charger and fits right for the complete maintenance charging. This charger uses an automatic 8-step charging mode, and it will do everything for you. Just connect and let the charger do the job for you. This charger is perfect to maintain charging or charging smaller car batteries at home. The price is lower than the CTEK charger mentioned before, and therefore it may be a better choice if you are not going to use it a lot or not charging big car batteries. Wrong-polarity protection and Voltage spike protection. 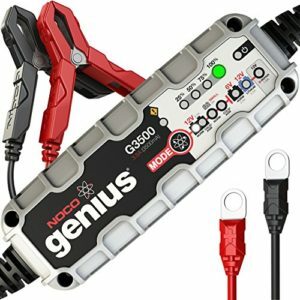 The NOCO Genius G3500 is the most sold car battery charger on Amazon. With thousands of positive reviews, we can confirm that this is a good charger. When you go to the Amazon site, you will see that you get a lot of different options for your charger. You can choose between 0.75 A / 1.1A / 3.5 A /4-Bank 4.4 Amp / 7.2 Amp / 15 Amp / 26 Amp. If you do not know which ampere you should choose you can check the FAQ that I wrote in the bottom of the article. Also, this charger, have active battery monitoring which helps you to connect the car battery charger and it will do the job for you. This charger is UV and water resistant which create a very long lifetime for the charger, and it can be used in the most extreme conditions. It does also have all the safety function you need, like wrong-polarity protection and voltage spike protection. It does also use clear LED Indicators for the charging, and the charger is simple to use. 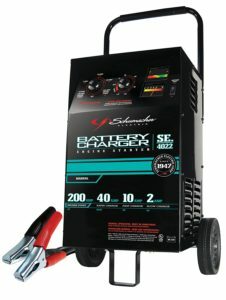 The Schumacher SC-12-1200A-CA is a fully automatic charger made for all types of chargings. What’s good with this charger is that it can charge both 6-volt and 12-volt systems, which is perfect if you want to charge both your motorcycle, ATV and your car with the same charger for example. You can choose between maintenance charging (3A), medium charging (6A) and fast charging (12A). An excellent car battery charger that does most likely have all the functions that you need. The charger is simple to use, connect the charger clamps and choose which charge you want and let it do the job for you. It comes with a LED Display, and the charger is using a microprocessor to control the charging to charge the car battery at the perfect rate, both for maintenance charging and fast charging. The charger comes with strong 50 AMP clamps, which is required if you are going to charge the battery fast. 3A – 6A – 12A charging options. 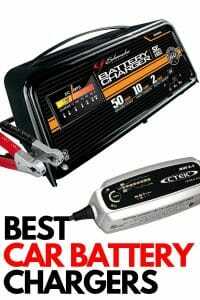 This is a budget variant of our car battery chargers on this list. The charger is cheap, and the charger is tiny, so you can store it in your glove box or your garage. The charger is using a smart charging monitoring to charge your car battery the best way. You will also get a DC plug to your cigarette 12v plug which you can charge your car battery via this plug instead of locating the battery. It’s perfect on a lot of cars where the car battery is located at difficult places, like under a seat or in the trunk. The charger has the capacity of 1.5 Ampere, which is not a lot but may be enough if you want to maintain charge your car battery. I do only recommend this charger if you need a very cheap maintenance charger because it will take a very long time to charge any larger car battery fully. If you want to charge your car battery fast, I recommend choosing another car battery charger. 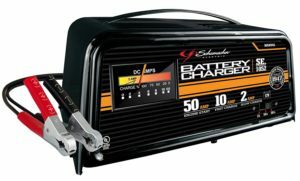 The Stanley car battery charger is a robust charger with the latest technology. The charger is wholly digitalized and have a great monitoring system for any types of charging for your car battery. You can charge your car battery either with 15 or 25 MAX Amp rate, depending on which of the models you choose. The 25 AMP model is a bit more expensive, but I do recommend to get it as it’s a much better overall charger and it’s worth the money. The Stanley BC25BS have all functions you may want in a car battery charger like Reverse polarity protection, active battery charging monitoring, 3 stages charging and much more. The whole charging process is controlled by a computer, which you control from the buttons and the LED screen at the front of the charger. Another thing worth mentioning about this charger is the Alternator Checking function, which you do not find in the other chargers. This functions can be excellent to have if you want to check the alternator charging if you have the car battery charger connected to the vehicle while it’s running. Here we have the big brother of the other NOCO charger mentioned before in the article. This is a better version of it if you want a more powerful charger to charge bigger batteries or want to charge faster. What’s friendly with this charger is the option of charging in 12-volt or 24-volt. Perfect if you’re going to use the charger both for charging your 24v truck and then charge your 12v car after that. Also, this car battery charger is using an Active battery monitoring, which makes sure that you always charge your car battery at the perfect rate to prevent any damages to your car battery. This also makes sure you can have the car battery charger connected to your vehicle 24/7 and let the charger do the job for you. 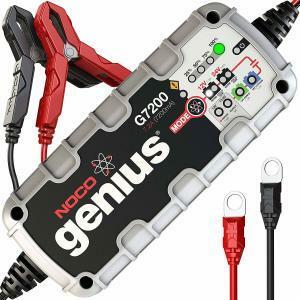 This version is the G7200, which gives the ampere rate of 7.2 A, which is enough for the most kinds of batteries. But, if you enter the link, you will find out that there are a lot of more options for this charger if you need an even more powerful car battery charger(Up to 25A). Now we have come to another powerful charger. This is the Schumacher SE-1052 charger. What’s different with this charger as it’s a more of standard car battery charger without active charging monitoring, which requires a manual checking of the car battery when you are charging with this charger. 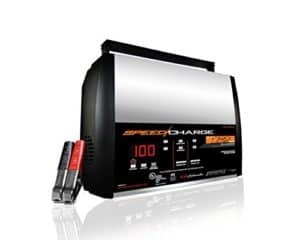 A lot of people may not estimate this, and if you want to maintenance charge your car battery for during long times, you should not choose this charger. The good thing about this charger is that it’s compelling and can jump-start your vehicle within minutes by charging the car battery with the whole 50 amps. The charger uses LED indicators to know when the car battery is charged, and it does also have overcharge protection to make sure it does not damage the car battery when no active battery monitoring is used. 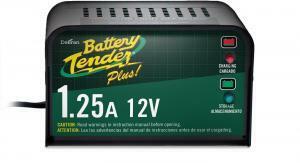 The Battery Tender Plus charger is a charger that you can rely upon. The quality is excellent and it has the most common function that you need. This is more of a maintain charger, because the low charging rate @1.25A, which may not be enough if you want to charge your car battery fast. The Battery Tender plus have the most safety functions that you need like reverse polarity protection and spark protection. You will also get the whole, 10 years warranty, which may tell us that this is a high-quality charger for the money. The charger comes with a charging timer which may help you to not charge the car battery for too long to cause damages to it. The charger comes with both O-ring terminals and normal clamps. Now we have come to the last product in this list, the Schumacher SE – 4022, but do not judge it. We did not place this in the last place of this list because it’s a lousy charger, no. We put it here because of it a colossal charger and may be more fitted to workshops or other bigger vehicles. Most people prefer smaller and cheaper car battery charging for home-usage. But if you want a powerful car battery charger and are ready to spend a bit more money, this should be your choice. 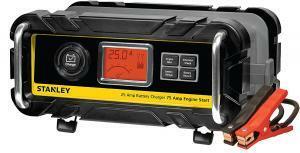 This charger does also work as a jump starter with the whole 300 A jump-start capacity. You can also maintain charge your car battery at 4 volts if you want that. Things to consider before buying a car battery charger. There are a lot of different things you can look for before you purchase a car battery chargers. Here is a list of the most common things you should look for before your purchase. The price is always an important part when you should purchase something. Ask yourself what you are going to use it for? How much are you going to use the battery charger? If you are charging your car battery once a year, you will probably not need to purchase the most expensive car battery charger on the market. But if you are going to use it for professional usage at a workshop, for example, you may want to look for a more long-term car battery charger which will last a long time. You should always make sure that you choose the right voltage of the battery charger after your needs. Most cars use 12-volt battery system, and you want to make sure that the charger can charge 12 volts. A lot of chargers do have both 6-volt, 12-volt and 24-volt charging, but you should always double check, so you choose the right charger for your needs. For example, if you are going to charge both your motorcycle with 6-volt and your car with a 12-volt battery system, you have to find a charger who can do both. Bigger trucks can have 24 volt systems in some cases. You do also have to ask yourself if you are going to maintain-charge or use it for fast charging the most of the times. If you are going to maintenance charge it the most, you can choose a car battery charger which charges with lower amperes and have an active charging monitoring. If you are going to charge car batteries fast a lot of times, you should choose one which gives a lot of amperes, and maybe with a jump-start function in sometimes. This is the same as the subject before almost. Make sure you choose the right Ampere of your needs for your car battery charger. The most chargers can charge with a lot of different ampere rates. But you want to make sure you choose the right for your needs. For example, if you are only going to maintain charge your car battery, you can select a charger under 5 amperes, while if you want to charge faster, I recommend at least 10 amperes of the charger. You do always want to make sure that the car battery charger comes with the right wall socket connector for your country. Different countries use different wall socket connectors, and the manufacturer’s location may not be the same as yours. So always make sure that you check this before purchase. Choosing a car battery charger with an active car battery charging monitoring is essential, especially if you are going to maintain charge your car battery a lot and you want to choose a charger with great monitoring not to damage your car battery in the long run. Usually, the CTEK chargers do have excellent monitoring. Because of this, you can almost have the car battery charger connected 24/7; it will do the job for you. You do also want to make sure that you choose a car battery charger with safety functions included. One of them is reverse-polarity connection safety, which may save your whole car’s electric system if you accidentally connect the positive terminal to the negative and vice versa. This can destroy the whole electrical system if the safety function is not included. Another safety function you want is to choose a spark-proof car battery charger when you are connecting the connectors to the car battery. Some car batteries leak battery acid, and if you create a spark when you are plugging the charger, the battery can explode. The last thing you want is to get exploded battery acid in your eyes, because it may result in permanent blindness if you are not washing it way directly. If this happens, wipe your eyes and visit a hospital as fast as possible. ALWAYS USE EYE PROTECTION AND OTHER SAFETY PROTECTION WHEN WORKING ON A CAR BATTERY. You should also check for a charger with overvoltage protection because overvoltage can cause severe damages to your electric system and you don’t want that if you are charging the car battery with it attached to the vehicle. Overvoltage can damage the system severely and you may have to replace a lot of different control units, as they are susceptible to it. This may result in a cost of over 10k$ or more. If you are going to jump-start your car with a car battery charger, you have to choose one with this function. But the jump starting function in these chargers are not often that strong, and if do need this function, I recommend you to get a Jumpstarter instead for this task. You can find one in our other related articles(Best Jump Starter). How do I connect and charge my battery? First, you have to locate your car battery. It is often located under the hood, but in some cars, it can be found in the trunk and under any seat. Some vehicles do also have two car batteries, and if you charge the wrong battery, it won’t make any difference. I recommend checking your repair manual or ask us to find your car battery. When you have found your battery, you have to check for the positive “+” battery terminal (Often red) and the negative “-” battery terminal (Often Black). There is often a mark on the battery itself which is the positive and negative. If you wire these wrong with an old battery charger, you can damage a lot of parts in your car. New car battery chargers do often have polarity protection that will save your electronics, but still be very careful. Connect the red clamp to the positive terminal and the black to the negative and read the manual of the charger how you should start it. Often there are several settings like “Charging” – “Maintenance” and “Recond”. Choose the setting you want to do with your battery. Some vehicles do have charging/jump starting clamps in the engine bay if the battery is located somewhere else. You can often charge via these clamps, but it’s always better to charge directly on the battery if possible. Some vehicle manufacturers use battery monitoring, and you may have to go in with a diagnostic tool to see if the battery is taking charge. How long time can I charge my battery every time? With an old charger, you should not charge the battery for too long, depending a lot on the power of the charger. New chargers have active battery monitoring, and they will shut off the charging when the battery is fully loaded. How fast will my battery gets fully charged with these car battery chargers? It depends on the power the charger gives out and the size of your battery. Read the manual of the car battery charger. A charger with higher Ampere (A) will charge your battery faster. Is it best to charge my car battery slow or fast? Slow is the best to keep a long life for your battery. Usually, I say maximum 4 Ampere if you are maintenance charging your car battery often. You can charge faster if you only do it once because your car battery was low at a specific time and it won’t do much damage to your battery. So if you charge your car battery often ( Several times a week ), you want to keep the Ampere as low as possible for the best charging of your car battery. AGM batteries should be even slower charger than regular batteries. You can often see on the label of your battery if it’s AGM or not. If you want to learn more about this subject, you can check out our guide How to charge your car battery the best way. Do I have to fill battery water before charging my car battery? Can I charge my car battery while it’s connected to the vehicle? Yes if you have a newer charger with active monitoring and voltage spike protection. Old chargers could give voltage spikes and damage electrics in your car. More modern chargers will not provide these voltage spikes, and it is harmless to charge your car battery while it’s connected. If you are not sure, always check the manual of your car battery charger and follow their recommendations. Can I jump start my car with these car chargers? How do I know what size (Ampere) of the charger I should buy? Ask yourself what you are going to use it for. If you are only going to maintenance charge your car battery, you will need a maximum 4 Ampere. If you think you are going to use it for both maintenance and fast charging, it is better to buy a large/more powerful car battery charger. A big charger will often have different options and not put out that much ampere if you set the setting for maintenance charging if it has this function. I think my alternator is not charging properly? This is a common problem. Charging the battery may help for a short while, but if the alternator is charging a low amount of power, the battery will go down again soon. You should always measure with a multimeter on the battery when the engine is at idle. The voltage should be somewhere around 13 – 14.5 volts depending on how many power supplies that are on. If it is charging under 13 volts at idle, check all connectors and ground cables. Check the trouble codes with an OBD2 scanner. You can find different OBD2 scanners on our review page: Diagnostic scanners. If you want more in-depth troubleshooting help, ask us at our homepage, and I will help you out. Choosing the right car battery charger for your needs are not always the most straightforward choice. I do recommend you to spend some money on a good charger because you will not regret it. You will save money by not replacing your car battery all the time. Choose a charger for your needs. <4 Amp if you are only going to maintenance charge it and >4 amp if you want to do speed charges sometimes. Slow charging is the best for your battery. If you have any other questions about car battery chargers, you can comment down below. If you have any other car questions, you can check our other articles on our blog or ask us a problem on our homepage. I hope you enjoyed this article and your new car battery charger! Your post, your information help to understand about the battery and the charger cost, So it helps some people for buying a good battery. Thanks for your review of our post. You’re welcome!